The Bell-Horn Pull-It Back Support Brace is designed to reduce the amount of stress and strain on your back, allowing you to return to your active lifestyle. Intended to meet the performance needs of athletes, it's ideal for playing golf, tennis, and other low-impact sports. You can also use this brace while hiking or horseback riding. 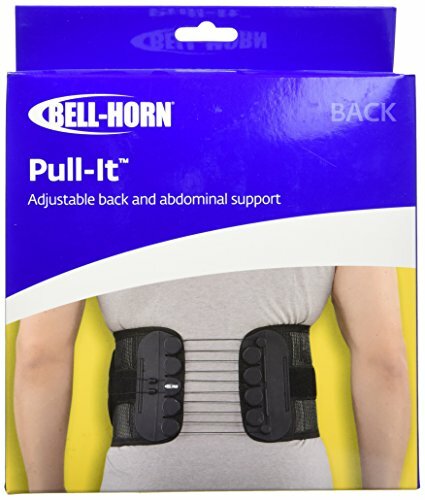 The Bell-Horn Pull-It Back Support Brace features a patented Mechanical Advantage Pulley System. It provides a 5-to-1 ratio that is low-friction, creating powerful, smooth and easily-controlled compression. This allows for one-handed tightening and loosening of the brace. The fully adjustable, lightweight and breathable mesh material means the brace can be worn comfortably, and provide compressive support all day long, so that it helps relieve back pain, weakness and fatigue. Universal design allows the Bell-Horn Pull-It Back Support Brace to be used by both men and women. One size fits most (32" - 51" waists). Posture Corrector for Women and Men - The Dusroc Clavicle Shoulder Support Brace and Back Straightener Kit Will Help to fix Bad Posture & Eliminate Upper Back/Thoracic Neck Pain.